This Sabyasachi bride's Offbeat Mehendi look is breaking the internet! I am sure you would have seen this Sabyasachi bride’s picture scrolling through your instagram a multiple times by now. Well, that’s because her mehendi look has literally been breaking the internet and HOW! Neha Lal Sigh made a beautiful bride-to-be in a fuschia Sabyasachi lehenga from the designer’s latest summer collection. 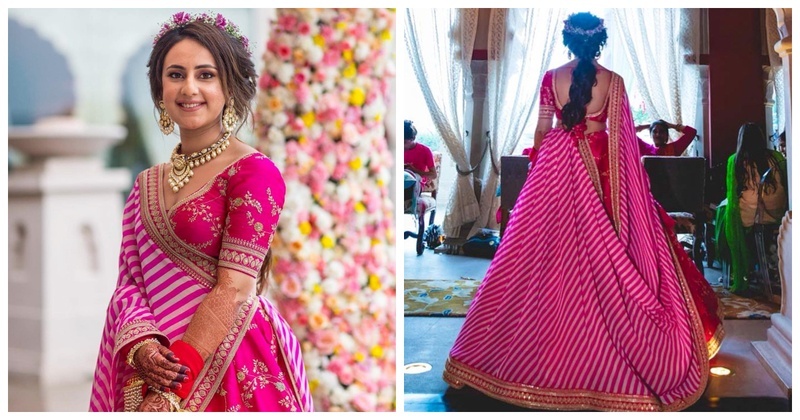 She chose to wear a fuschia pink lehenga skirt and choli with floral embroidery and paired it with a pink and white striped dupatta bringing an edge to the outfit. She completed her look with a statement choker and necklace which she paired with a gorgeous floral tiara! Also, look at that stunning bridal hairdo! Do you see those strings of flowers hanging from the ceiling where the colours completely compliment her lehenga? Some major #RegalVibes there! P.S totally love their wedding hashtag too. It’s #NeShaan which combines Neha and Eshaan in the cutest way possible. ….and that floral wreath!! Floral wreaths have been trending this wedding season and I have been seeing more and more brides incorporate them in their wedding decor. This minimal wreath with the picturesque backdrop of Fairmont Jaipur the is just ah-mazing! Eshaan - the dotting fiance complimented Neha’s look with an ivory kurta-pajama set from Sabyasachi with floral prints on it. He completed the look with a purple nehru jacket and stunning shoes. Totally in love with this Sabyasachi couple! Also, if you are wondering about how they fell in love, then it seems like wooing this beauty was not an easy task for Eshaan. Here’s what his BFF had to say about it, “From rain dances, to school fêtes, to study sessions at your hotel which would turn into brainstorming sessions for churning out ideas of how to woo Neha, to the amazing wedding weekend that was. You’ve come a long way brother. Here’s wishing you both a happy, fruitful and long life together. Cheers to the next era in life. Neha this may be eight years late but for what it’s worth, welcome to the madness.”. Well well, here’s wishing this couple a lifetime of happiness!